What log cabin interior style do you like? So which log cabin interior finishes should you go for? Well for many people, being in a log cabin is all about being surrounded by beautiful timber! For some however, all timber is too much for them and they might like a more modern or lighter feel by using plasterboard or other materials. The cost of materials will vary, but also think about what use your log cabin will get. The materials must be suitable for the use each room will be designed for. So while I love all timber interiors, I would still recommend the use of water proof materials in wet areas, such as kitchens and bathrooms. 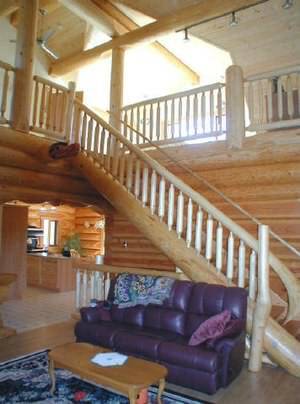 We'll help you decide by going over the floors, walls and ceilings, as well as other relevant log cabin interior aspects. 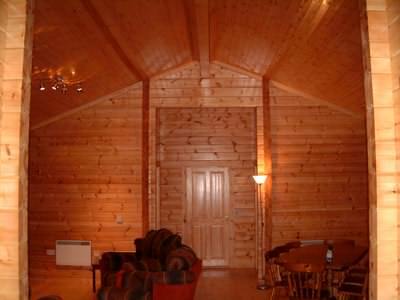 Timber log cabin interior or not? Your first consideration is whether you want to have as much wood inside your log cabin as you can, or if you want to break with tradition and mix it up a little bit! If you want all timber inside then it is really a case of what type you use, especially paying attention to what wood flooring you choose, as this will take a lot of the wear and tear over the years. However, as previously mentioned, don’t stubbornly demand timber everywhere if that room is a wet area and this will eventually take its toll on the timber. Also if you don’t want timber everywhere you may go to the other extreme of a very modern finish of, say, plasterboard. Some people like to blend the two, which can give pleasing results. The introduction of stone or brickwork can also provide a nice contrast to the timber. Find out what the options are and discover their pros and cons of all the main log cabin interior finishes. Many people like to go for wooden flooring in a log cabin, as this is the natural choice. Don’t always go for a matching species of floor boards to your logs though, as in some cases the wood may not be hard enough to stand up hard use. Think about where you will have the most traffic in the house and use appropriate flooring. Many people like to use rugs, which softens up the wood décor and gives it a more cosy appeal. Some people may carpet some parts of a log cabin, or use a waterproof material in rooms where there are wet activities. Again think about the primary usage of each room and what would be most suitable. We’ll take a look at all the options and help you decide which flooring to choose. Ceilings are usually timber in a log cabin. However this again can be an area where different materials can be used. In a 2 storey log house for example, in countries which have strict fire regulations, suitable materials have to be used to give the minimum fire protection. In some cases (like the UK) this can mean that even fire treated timber linings will not comply with the regulations. So pay particular attention if this situation applies to you, as we will explain this aspect in more details later. For many people with single storey cabins, small log cabins where the regulations do not apply, or in countries with more relaxed regulations, the choice of ceiling materials is largely based on what look you like best. Kitchen, bathrooms and any other rooms you may use for wet activities must be finished with the right materials if you want the original look to last. What is truly important here is protecting the logs, your structure and strength of the building. Even timber boarding in very close promixity to wet areas is likely to deteriorate with constant exposure, unless it is extremely well protected. It is often better in such areas to use a truly waterproof material, such as tiles or waterproof panels which are now available. 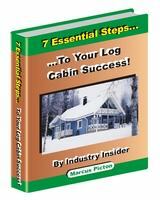 Approach a "wet room" style of bathroom with real caution in a log cabin! You must at all costs keep the water away from your logs. If you must have a wet room, ensure it is sealed very well and this will not be affected by log movement. Ensure your wet areas are properly planned and constructed. In countries with strict building regulations or codes, fire treatment can become a very significant issue. This is because most of the internal timber used in a log cabin in these locations will need to be fire treated. This is a very expensive process (whichever method you choose) and may even sway your choice of interior materials in the first place. There are 2 main methods of achieving the necessary fire protection on your timber. Both have different advantages and disadvantages. We reveal why fire treatment needs to be looked at early on (especially in countries like the UK), so you are not hit with a big bill you were not aware would be needed! 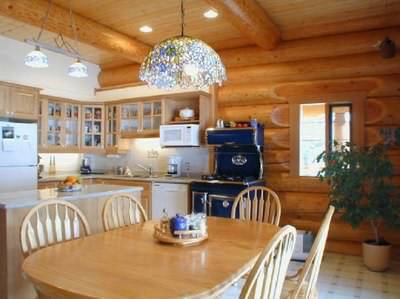 The cost of different log cabin interior materials does vary considerably. Then add on top of this the installation cost differences and the cost of finishing different materials and it soon becomes apparent that your choice of materials can affect the bottom line greatly. Always consider the big picture when planning ahead and if you are not sure ask your log cabin supplier to advise you on likely cost differences between materials. For larger log cabins, like a family home, this can be an area where the budget can be influenced quite a bit. Find out more about how cost of materials will affect your log cabin interior budget. Want some inspiration for log cabin decorating? Take a look at a Canadian log cabin which was redecorated, (link opens in a new window).